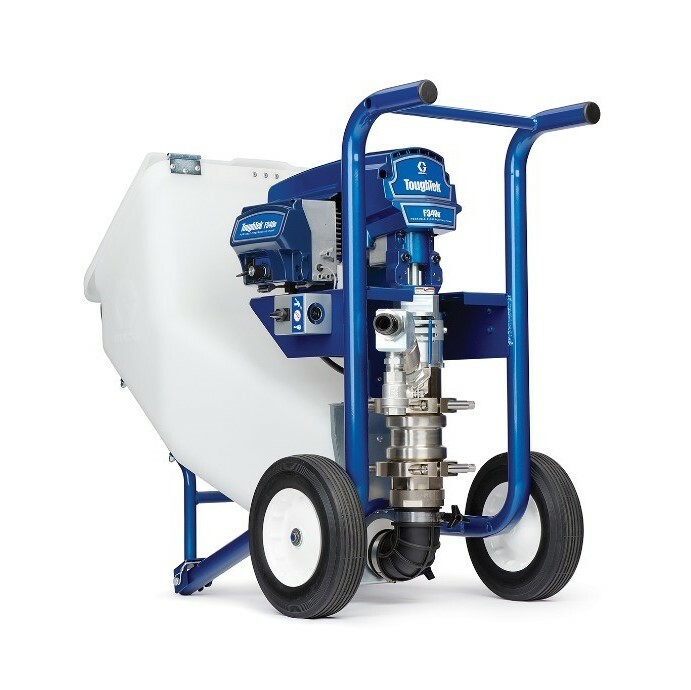 Designed for fireproofing applications, Graco’s ToughTek Fireproofing Pumps handle low, medium and high-density sprayed fire resistive materials (SFRMs), delivering them with a smooth, steady flow rate. Engineered with Graco’s proprietary piston pump technology, the ToughTek F340e piston pump delivers high pressures to move materials through long hose lengths – which helps you spray longer and farther to get the job done sooner. It is perfect for small to medium jobs that spray up to 100 bags per day and is capable of producing pressures of up to 600 psi using an energy efficient direct drive electric motor. This high pumping pressure will allow your crew to spray up to 150 feet from the machine and pump 15 bags per hour. For convenience, the ToughTek 340e plugs into a standard wall outlet and is compact, portable and easy to move around the job site. Take it anywhere – doorways, halls and elevators. ToughTek Fireproofing Pumps fit into tight spaces so you can spray with ease. You spend more time spraying and less time moving your equipment around the job site. Lastly, its durable piston pump stands up to highly abrasive fireproofing materials and the quick knockdown design makes maintenance fast and easy, eliminating the frequent expense of replacing pump parts.